Home Partners Resellers, Dealers, Partners – What’s the Difference? 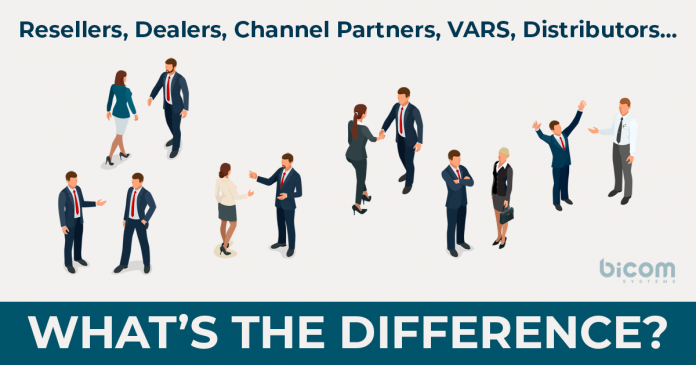 Resellers, Dealers, Partners – What’s the Difference? These are all words that get thrown around in our industry, but what exactly do they mean and what is the difference between them? Resellers, as their name implies, purchase a product or service from a parent company and sell it to end users for a profit. Of course the words “purchase” and “sell” are used loosely here; in today’s cloud world, this could really mean “rent” or “host”. Typically a reseller will brand the product as their own and not reveal the parent company to customers. The benefit of a reseller relationship is profit and business growth for both the vendor and the reseller. Dealers, on other hand, have less involvement with the product itself and focus more on making sales. They do not assign their own brand to the product as they are simply selling it on behalf of a parent company. They may provide support and upgrades to their customers, but it will be no secret that they are acting on behalf of a third-party. For this model to work, the parent company must only sell through dealers with no option for direct sales. Channel Partners are similar to resellers, but have a deeper, bilateral relationship with the parent company. A partner program will lay out the expectations and benefits of such a relationship. The parent company will be more invested in their partners and more dependent on their success. Together, they may expand the products and solutions to become a one-stop-shop that encourages long-term commitments. The partnership will involve consistent communication, shared marketing materials, ongoing involvement in the product, and more. VARs are Value-Added Resellers that add their own services to a third-party solution. Distributors are similar to dealers but maintain an even looser relationship to the manufacturer. Many of the parent companies in our industry work with resellers. They are white label and give full control of the product to their resellers, but do not necessarily form a close relationship. Other parent companies choose the dealer strategy and sell their solutions with their brand still attached. Unfortunately we have seen some of these well-known companies selling through dealers while also selling directly to end users – a very sticky situation to be sure. Bicom Systems chooses to work with partners. Our business is all about relationships and helping you grow your brand. Our motto (and part of every blog piece lately!) is your success is our success. We believe a partner-centric model is best because it grows our business, grows your business, and ultimately grows the market. When shopping around for a vendor, do not get caught up in the terminology. A so-called “partner program” could actually be a dealer network in disguise. A solution advertised for “resellers” may actually be part of a true channel partnership. Bicom Systems often uses the word “reseller” for the sake of recognizability, even though our selling model is strictly based on partnerships. The point is, the words that the vendor uses do not matter as much as their actions. Pay attention to what the vendor expects of you and what you will get in return. Is their product white label? Do they offer marketing materials and other tools to grow your business? Will they require you to meet quotas? Will they ask for your end user details? All of these things are more important than the terminology. If you are interested in learning more about what it means to partner with Bicom Systems, please contact us today.